GALION — For years, Mark Schneider, of Mark A. Schneider Funeral Home in Galion and Crestline, has been providing local residents with the advice, comfort and care they desperately need when dealing with the death of a loved one. 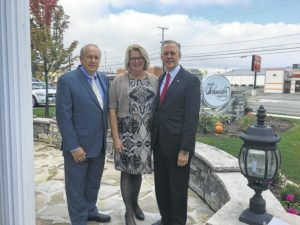 But Schneider recently handed over the keys to both funeral homes to LeAnne and Gene Gompf, owners of Gompf Funeral Services in Cardington. “The one thing I wanted when selling the business was to make sure I sold to someone local. LeAnne grew up in the Galion area and both she and Gene have ties to Galion,” Schneider said. Schneider came to Crawford County in 1975 and started working as an employee at the funeral home, which was owned by Robert F. Beck, in Crestline. “I started as a manager in Crestlin, then purchased the funeral home in 1977,” Schneider said. Schneider then went on to purchase the Galion funeral home, Snyder and Kubach, in the early 1980s. Schneider said his grandfather died when he was five-years-old and he became fascinated with the funeral home business. “I wanted to know like who tied his shoes. Why do they shut the lid?” Schneider said. He says he is fortunate that he has been able to work in profession he is passionate about. “It is so rewarding to be able to help families when they are going through one of the toughest times of their lives. We can handle the arrangements for a loved one with a clear mind and alleviate some of the stress for families,” Schneider said. Gene Gompf said he grew up in Morrow County, while LeAnne grew up in a house on Ohio 288, outside of Galion. “I worked at the L & K Restaurant in Galion throughout high school,” LeAnne said. Gene said his father worked as a funeral director for Curl Funeral Home in Cardington for 36 years. “He never had to purchase a funeral home. When the tornado hit Cardington in 1981, it destroyed the funeral home and the family that owned it decided not to rebuild. So my dad did,” Gene said. Gene, a graduate of Cardington High School, attended The Ohio State University and Cincinnati College of Mortuary Science, graduating in March 1985. Gene completed an apprenticeship under his father and received his Embalmer’s and Funeral Director’s Licenses in May, 1986. LeAnne, who is a real estate agent for Century 21, is also a funeral director, receiving her license in November, 1990. The couple has five children and six grandchildren. “Two of our children are funeral directors and one is doing an apprenticeship at the Pittsburgh Institute of Mortuary Science,” Gene said. In taking over the Crestline and Galion locations, he said he will keep the current staff . “We will keep the name the same for now and will eventually change the name to Mark A. Schneider-Gompf Funeral Home,” said Gene, who also is part-owner of Werner-Gompf Funeral Service in Mansfield. Gene said anyone who has pre-paid for funeral services will have no interruption in their plans. “Everything will continue as is,” he said. Schneider said although he is retiring, he will still be working at both funeral homes. “I’m retiring, but I am not going away. I will be around the funeral homes to help out occasionally. Galion has been my home since 1980. I love Ohio and I love the Galion and Crestline communities,” he said. For more information, visit http://www.masfh.com.